After spending a quiet night in Luray, Virginia, home of roadside T-Rex, I drove north along Stonewall Jackson Highway and entered Shenandoah National Park through the Royal Front entrance. My plan was to drive the length of the park on Skyline Drive, then retrace my steps and camp at the park’s only open campground, Big Meadows. I knew I was in trouble when after two hours I had driven roughly ten miles. Shenandoah is not a park to be hurried through. It is a park to be slowly savored and taken in for what it is. A visual feast in blue. By the time I arrived at Big Meadows and quietly backed into my spot, it was pitch black. I crawled into bed, flipped on my fancy night-lite and managed to read a single page before falling asleep. SKYLINE DRIVE HAS A SPEED LIMIT OF 35 MPH. I FOUND MYSELF DOING 5 MPH MOST OF THE TIME. WHEN CHILDREN ON SMALL TRICYCLES GLIDE PAST YOU, IT’S TIME TO PICK UP THE PACE. Less than a mile from the entrance to Big Meadows, is the trail-head of Dark Hollow Falls. How can you not hike a trail with a name so foreboding? My trail guidebook warns that the descending hike to the falls is very steep and some may have trouble hiking back to the top. After walking downhill for about 30 minutes at what seemed to be a 45 degree angle, I tipped my hat to the guidebook. I also decided that I would gladly hike an additional 5 miles to avoid ascending the same trail. They say there is a fine line between determination and stupidity. I tend to err on the side of stupidity. At the bottom of Dark Hollow Falls, you are rewarded with an uphill view of a series of cascading falls. Water spills gracefully over lime green boulders, pooling for a moment before sliding downward to the next platform of ageless rock. From here the trail branches off onto the Rose River Loop Trail. As my finger traced the loop on the map, it finally came to a fire road and ultimately out to Skyline Drive at Fishers Gap Overlook. Ah ha. I can avoid the steep trail that brought me to the bottom. I congratulated myself for outsmarting the guidebook and set off following the Rose River, heading ever further down into the hollow. Author’s Note: See paragraph above with respect to erring on the side of stupidity. This is called foreshadowing. DARK HOLLOW FALLS. THERE ARE SIGNS AROUND THE FALLS WARNING OF THE DANGERS FROM CLIMBING ON THE ROCKS THAT MAKE UP THE VARIOUS LEDGES OF THE FALLS. OBVIOUSLY THE FAMILY OF SIX FROM BILOXI, EITHER COULDN’T READ OR HAD A BLATANT DISREGARD FOR CONVENTIONAL WISDOM. Rose Falls is a not quite as high as Dark Hollow falls, but heartier – stronger. It is also the exact spot where the skies decided to open up a few hours earlier than forecasted. Tucking my camera inside my jacket, lowering my head against the rain and wind, I turned north and almost immediately slipped over the falls. I caught myself on a perfectly placed birch and pulled myself back from the edge. At this point you may be asking yourself, why is he so close to the edge? Well, that’s how you get a good shot of the falls. (Moving forward, please ask yourself harder questions.) The rain insisted on continuing for the next hour or so, which would have made the hike less than ideal, had I not met a couple that trivialized the rain. Whenever I see a couple or a few people taking a photo of each other, I always ask if they would like me to take a photo of both of them, or the group. On this occasion, the rain had finally let up and I was crossing a foot bridge across the Rose River. A dark haired couple, speaking a language I didn’t recognize, were taking photos of each other. I asked if they would like me to take a shot of them both. “Yes, please.” They had a genuine smile. A smile that makes you want to smile in return. I took several photos of them and handed back the iPhone. (I was not paid to insert the brand iPhone. However, I would gladly accept their money and insert iPhone several times into each piece I write. I would actively seek out iPhone users and insist I take their photo – wrestling them to the ground in the process if need be.) They asked if I wanted them to take a photo of me and I said yes, handing them my iPhone. As they started to take the photo I took off my hat and said – I hope I don’t scare the small children. They laughed – a belly laugh. Uh oh, I have an audience. What is that accent I detect? “We are from India.” It’s a beautiful lilting accent. What is your name? “My name is,” and he said something I didn’t understand. “In English it means Song of God. This my wife,” again saying something I didn’t understand, “which means Honey.” I’m sorry, I thought you said Song of God. “Yes,” still smiling, always smiling “we are Sikhs. In our religion you take a new name. I was given,” yet again something I didn’t understand, “which means Song of God.” And your name is Honey? “Yes.” Let’s review. I’m with Song of God and Honey and my name is Smitty. I’m not worthy of your company. At this point I think they are going to wet themselves they are laughing so hard. “You should convert Smitty. You would get a new name.” Can I be He Who Must Not Be Named? More laughter and I’m actually holding up Song of God. “You are a funny guy. What do you do?” What a great audience I’m thinking as Song of God and Honey look at me for my answer. I can sneeze like Donald Duck. EVERY ONCE IN A WHILE YOU MEET A LOVELY COUPLE IN THE MIDDLE OF NOWHERE THAT TOUCH YOUR HEART. MY ONLY REGRET IS THAT I DIDN’T USE MY IPHONE TO TAKE A PHOTO OF SONG OF GOD AND HONEY. After entertaining my new Sikh friends and telling them to try the veal and tip their waiter, I started the climb up River Loop Trail. According to my brilliant map reading skills, the trail would intersect with a fire road and then drop me on Skyline Drive down the road from where I began. Thus skirting the steep path I had originally descended. My arm hurt slightly from patting myself on the back as I rounded the final loop in the trail and found myself staring at the end of the very path that I had worked so hard to avoid. This is a joke right? Who moved the waterfall? In all my effort to eschew the original climb, I had missed a turn in the trail and was now confronted with a mile walk straight uphill. Once again erring on the side of stupidity. Maybe I should convert. I can be Chorus of Calamity. NOT THAT DIFFICULT TO SEE WHERE BIG MEADOWS GOT ITS NAME. I WISH I COULD HAVE BEEN THERE IN THE SPRING WHEN ALL OF THE WILDFLOWERS ARE BLOOMING. As with many national parks, you can get a broad sense of the land by driving its main artery. Similar to Acadia in that you can visually digest large swaths of the park from your car, or in the case of Shenandoah, from any of the 75 overlooks along Skyline Drive, where each overlook competes with the last. Nature’s one-upmanship. One view shyly permits a glimpse of a distance family of ridges, bathed in blue. Next an offering of timeless forest, where colors compete for your adoration. All lovingly hovered over by a blanket of ever-changing clouds. Rising from the horizon, using an endless palate of color, a stygian sky may glide into velvet blue in minutes. Deeply bruised storm clouds silently drift between ridges. A breathtaking canvas of heavenly blue, melding into the textured blue of earth. 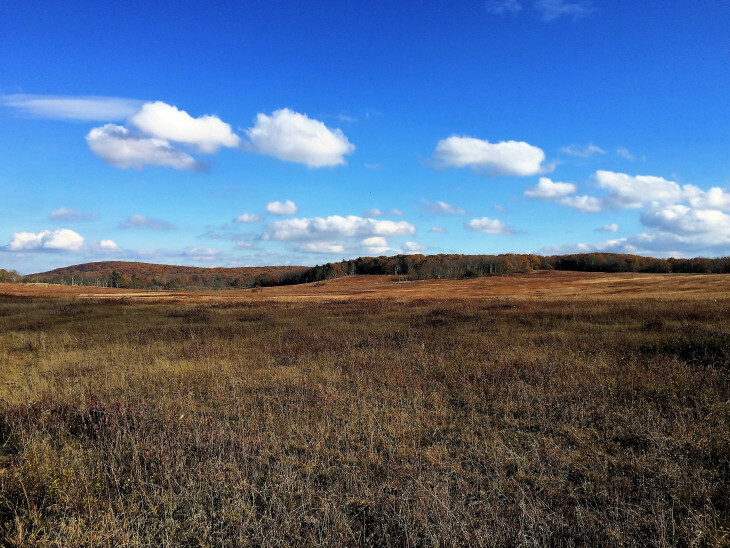 EARTH AND SKY – WITH APOLOGIES TO BOB DYLAN – TANGLED UP IN BLUE. 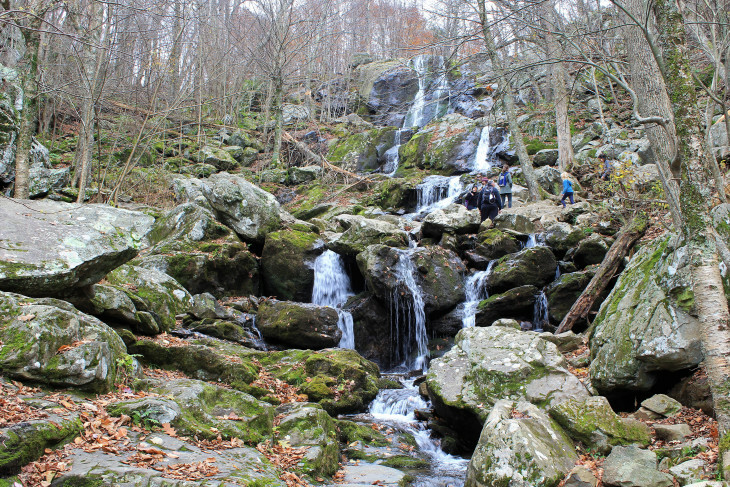 MANY OF THE TRAILS IN SHENANDOAH INTERSECT THE APPALACHIAN TRAIL. THE CIVILIAN CONSERVATION CORPS PLAYED A KEY ROLE IN THE CONSTRUCTION OF MANY SECTIONS OF THE TRAIL. Hiking to the top of Blackrock is not terribly difficult. The trail is a steady climb – not too steep. But nothing prepares you for what the top of black rock presents. Thousands of grey menacing boulders, seemingly pushed up from the earth, piled on top of one another in a truce established thousands of years ago. Sitting at the summit of this great glacial scrape of earth, looking down at the seemingly unending ridges and hollows, you could easily imagine the sense of wonder the early settlers of the valley must have felt. Countless millennia have done little to change what I was seeing. It was a wonderful moment. VIEW FROM BLACKROCK. TEN MINUTES AFTER THIS PHOTO, THE VALLEY WAS FILLED WITH CLOUDS AND THE RIDGES BECAME INVISIBLE. TEN MINUTES AFTER THAT I TRIPPED OVER MY WALKING STICKS. Part of the fun of what I’m doing is meeting people from all over the United States and the world. Like Jeff from California, who had just finished driving from San Francisco in his VW Microbus. He had been on the road for two months, with his puppy and told me he had paid to camp only twice. That is no small feat. Then there’s the couple I met in the laundry, who have been traveling for the last four years. They lit up when telling me about the places they’ve been – the experiences they’ve shared. Each year they return to their hometown in Kentucky for a doctor’s visit and immediately set out on the road again. They struck me as two of the happiest people I’ve ever met and I admit to letting a little envy enter my heart. I met Earl Varona and his friend Nellie on a turn-out while helping a woman break into her car where she had left her keys. Apparently I look like a seasoned thief. I asked Earl if he had climbed Old Rag Mountain, because due to weather I didn’t get a chance and the view is supposed to be stunning. He said yes, pulled out his phone and showed me a few very cool photos of him at the summit. I asked him to email a photo so I could post. I think I also asked him to send a photo where hopefully he couldn’t be recognized so I could say it was me at the summit. Thanks Earl. It was pleasure meeting you and Nellie. Stay in touch. LADIES AND GENTLEMEN, EARL VARONA ATOP OLD RAG MOUNTAIN. IF YOU LOOK CLOSELY THAT’S ME DOWN IN THE VALLEY TALKING TO SONG OF GOD. RUSHING WATER IS FOUND ALL THROUGHOUT SHENANDOAH. THE STILLNESS OF A DOWNED BRANCH AND WHAT IT HAD CARELESSLY GATHERED CAUGHT MY EYE. ALL ALONG THE ROSE RIVER ARE POOLS THAT WOULD MAKE GREAT SWIMMING HOLES. HUCK FINN KIND OF SWIMMING HOLES. BOTH OF YOU THAT FOLLOW THIS BLOG KNOW THAT I HAVE BEEN RELENTLESSLY PURSUED BY PODS. DISGUISED AS MILKWEED, THIS ONE CONTINUES THE STALKING. IF I SUDDENLY DISAPPEAR, QUESTION THE PODS.